During my last days at IBM, I was very busy writing. I was fortunate to work on some exciting publications that have recently become available. The first of these is an article entitled What it takes to drive IBM Lotus Connections Adoption in the Enterprise. It was published on the IBM developerWorks site on June 30. For this article, I interviewed 4 different IBM customers who are currently using Lotus Connections at their companies. I wanted to go beyond the generally recommended adoption guidelines and find out what had really worked in motivating the general population of a company to use social software. I took the most valuable nuggets of information and looked for the common threads to produce a list of recommendations that can be used by anyone planning a rollout of social software in an internal environment. The next project I worked on was as a contributing author and reviewer of The Social Factor. I was very excited and honored to be asked by the author, Maria Azua, to work on this project. I was given a list of twelve points to discuss about the business implications and transformational opportunities that social networking can bring to companies and their employees. To tackle this challenge, I wanted to share not just my experiences and knowledge, but that of individuals I felt were using social networking tools for maximum business results. I interviewed different people both inside and outside of IBM who I found either through their blog, tweets, or LinkedIn profiles. I also used Twitter for real time research in answering some of the questions. I handed over my 8,000 word draft to the editor in mid-January. He did an excellent job of performing an “extreme makeover” on my work, so much so that I couldn’t believe I had actually written those words! A few months later, I was asked to review two of the chapters before final publication. I did find a funny error, where a photo of one person was labled with the wrong name. Fortunately, I knew both of the individuals in question and I was able to catch the error. The editor had told me the book would be ready in October, but I was pleasantly surprised to find it on Amazon last week. So go ahead and order or download a copy! I would love to hear your thoughts. A couple of months ago, I was asked to contribute to an upcoming book being written by a team of really smart people inside of IBM. Since I like being in the company of really smart IBM people, I accepted! My task is to describe the cultural impacts of social networking in business, both inside and outside the firewall. The catch is that it all has to be original and unpublished material. I only know so much, so of course, I want to talk to YOU! I am especially interested in getting international (non-US) experiences and learning about different tools or sites that may be prevalent in different countries. The idea is to describe the business implications and transformational opportunities that Social Networking can bring to companies and their employees. What is the value of Social Networking tools? Why do people use these sites (for example LinkedIn)? Why tools like Facebook that started as a college tool are gaining popularity with business people? How social tools impact companies at the business level? What is the value of adding Social Networking and communities tools or services to a companies web site? Are Social Networking communities becoming stronger influencers than traditional “loyalty programs”? What companies are loosing for not embracing Social Networking? How employees can benefit from Social Networking tools? Can social tools help create a sense of teaming and camaraderie that sometimes business lack? Why employees should be encouraged to use Social Networking tools inside and outside of the enterprises? What employers have to gain from Social tools? If you have a unique perspective, funny experience, or great story that would fit under this topic and would be willing to be interviewed for the book, please leave a comment. I’m looking forward to hearing from everyone! I’ve been asked to provide input to a presentation that will be going in front of very senior IBM management sometime in December on how social software can help IBM with Mergers and Acquisitions. I spoke with a Lotus Connections customer recently in a company that had just been acquired. They were planning to have, “How will [acquiring company name] know who you are?”, sessions where they would demonstrate the value of having an updated profile with descriptions of their education, projects and contributions to the company. I think social software has huge potential to help in M&A’s. Let’s consider some scenarios. Scenario 1: You’ve just been acquired by IBM. You have no idea who to work with, or look for, or who knows what in this vast new company. Where to start? (This is the classic seeker scenario.) Of course you have Bluepages to find out who people are, but what if you want to get beyond that? There are multiple paths to take, all of them beneficial. Use Dogear to search for keywords, then find specialists who are the top bookmarkers in those areas. Or do a keyword search on Profiles to find people with particular expertise. Or do an expertise search in Small Blue (IBM Atlas). Or search Communities for a particular topic or interest. Or search Quickr for documents with specific keywords. Any of these methods will give you people and information. Ideally, they should give similar results. Scenario 2: You’ve just been acquired and want to let everyone in IBM know who you are and what you do. Do the inverse of scenario 1. (This is the classic contributor scenario.) Make sure your Profile is up to date. Contribute your bookmarks to dogear. Create a blog where you share your work experiences. Share your presentations on Quickr. Join communities, or create your own if one doesn’t exist for your particular needs. Scenario 3: You want to grow your network in the new company. Both scenarios 1 and 2 will help you to do this. Take it a step further and invite the people you find, or who find you, to join your network on Profiles, Fringe, or Beehive. Beehive provides a unique opportunity to get to know people based on common interests both personal and professional. Scenario 4: IBM wants to know the internal structure of the acquired company. This can be accomplished with a Social Network Analysis (SNA). This is a small survey, usually of no more than 3 questions, sent out to determine the communication patterns, knowledge holders, and relationships in an organization. You can involve the SNA Community in this process. These knowledge holders can be targeted to contribute their knowledge to the greater IBM community by performing some of the activities in scenario 2. This would help IBM leverage their knowledge more quickly. Provide Firefox browser with browser plugins and buttons already configured for Dogear and Small Blue on the standard build. This will help them start contributing social capital from Day 1. Provide training during the on boarding process on IBM’s vast selection of social software tools. Share success stories of how these tools have been used in to provide true business value. Ask employees to earn a social software merit badge within 30 days of joining IBM. Ask key connectors, as identified in the SNA, from acquired companies to blog about their experience coming into IBM. This will give valuable feedback to the M&A team, and give newly acquired employees a way to make themselves known to the greater IBM community. Don’t worry about doing the right or wrong thing with social software! No two groups or individuals will adopt in exactly the same way. That is to be expected and welcomed. How would you use social software to help in M&As? A couple weeks ago, I traveled to Monterrey, Nuevo Leon, Mexico to deliver a Lotus Connections adoption/user training workshop. The customer currently has their PoC environment up and running, so the account team asked me to come in to teach their early adopters how to get the most out of Lotus Connections. The customer selected 7 people to attend from various lines of business. The plan is for these attendees to sow the seeds of social software adoption within their groups. I used the “Getting Started with Lotus Connections” presentation as a guide to take them through hints and tips for using each of the 5 services. During the session, they used their PoC system to populate their profiles, create their own blogs, use an Activity, set up Communities, and import bookmarks from their browsers into Dogear. Along the way, I shared with them my personal experiences using Lotus Connections and IBM’s history and success stories with Web 2.0. I told them how well populated Profiles, with both professional and personal information, can help you advertise your expertise, and build connections with others in their organization. Here are some things I learned about them from the information posted that day. Wendy currently sends out a high visibility monthly newsletter. People respond to her with questions and comments via email, which she keeps track of, responds to, and incorporates into future issues. This is a very static way of exchanging the information and they wanted something more interactive. I explained to them how this could be accomplished more effectively with a blog. The team in Monterrey frequently has visitors from around the world who need recommendations on where to stay, restaurants, directions to the offices, etc. Of course, most of this information already exists on the Web and inside the company. I recommended a Community to collect these links. They can also use forums to ask questions and get personal responses from the Monterrey based staff. So, how is social software like sushi? For lunch, we ordered in from a local sushi restaurant. One of the rolls had the following description: Chicken, avocado, cream, jalapeno, breaded and fried. I joked with the customers, “That sounds more like a taco than sushi.” They went on to tell me that the sushi in Mexico is very, well… Mexican. 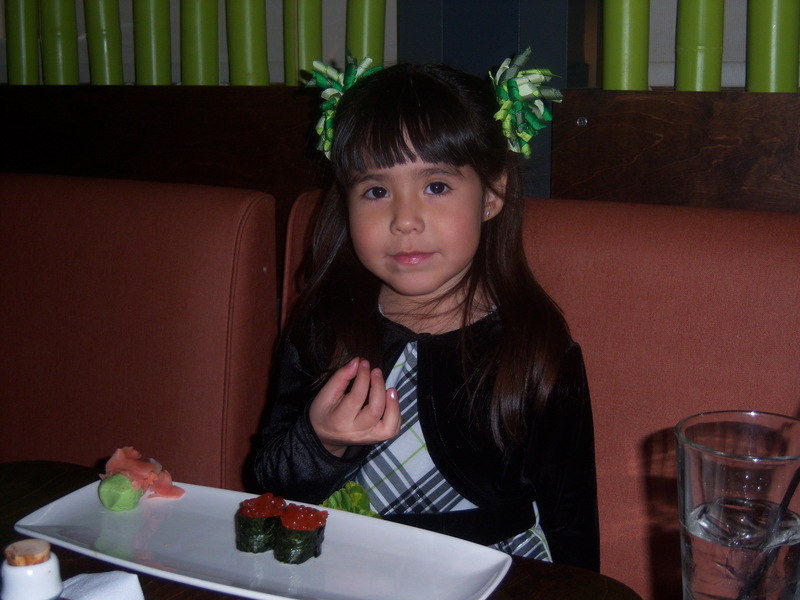 The sushi was served with jalapeno salsa, salsa de chile verde. The soy sauce came in 2 types: regular, and with lime juice. Mexicans eat most everything (tacos, fruit, drinks) with lime and chile, so I shouldn’t be surprised that sushi has been Mexican-ized. Ok, getting back to social software adoption – the same way that sushi has been transformed, made unique, taken its own form and identity depending on the culture of the people serving and eating it, so too with social software adoption. I don’t think any two companies, or even people within those companies will use social software in exactly the same way. Each individual can use it according to their own needs, requirements, and comfort level. People add their own unique perspectives and talents (flavors) to the business use cases or applications in order to make it more easily adopted by the larger population.